Chafee, a Paralympian, has been instrumental in the evolution of women's wheelchair basketball in Chicagoland. Oak Lawn, Illinois resident Ella (Cox) Chafee was inducted into the National Wheelchair Basketball Association (NWBA) Hall of Fame by Morgan Park resident Bob Szyman (NWBA HoF 2004) at a reception on Saturday, April 5th in Louisville during the 2014 National Wheelchair Basketball Association Championships Chafee is only the eleventh woman to be so honored. 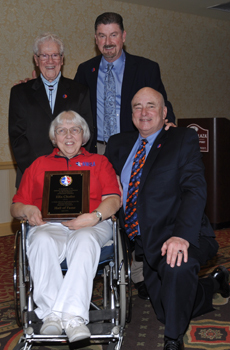 The University of Illinois at Urbana-Champaign alumna (1967) and retired Social Security Administration benefit authorizer was recognized for her lifelong commitment to the sport of wheelchair basketball. Excelling in wheelchair sports as an undergraduate, the talented Spanish major embarked on a sports career that included membership on the first USA Women’s Paralympic Basketball Team that captured the bronze medal during the 1968 Paralympic Games in Tel Aviv, Israel and competing in the 1972 Paralympic Games in Heidelberg, Germany, and in the 1996 Paralympic Games in Atlanta and being the captain of the 2005 National Women’s Wheelchair Basketball Tournament championship team, Rehabilitation Institute of Chicago (RIC) Express. A pioneer in the formation of the women’s division of the NWBA, Chafee was instrumental in the evolution of the women’s game in Chicago by organizing, playing and sometimes coaching for the Windy City Spitfires, the Chicago Charmers, the Chicago the Express, R.I.C. Express and the R.I.C. Chicago Sky. When not training or competing, the mother of two volunteered as a statistician and score keeper for the Chicago Sidewinders wheelchair basketball team which morphed into the Chicago Wheelchair Bulls. She and her husband Ian were standard fare at many games and tournaments for more than 25 years. The 2014 National Wheelchair Basketball Association Championships marked the 66th annual national championship event for the organization. The first was in April of 1949 at then Galesburg Campus of the University of Illinois.